January is always the busiest time for making huge life decisions – dieting, job hunting, exercising, and getting a divorce! As a result, it’s the perfect time for launching Ireland’s first and only Instant Online Divorce and Separation Agreement Service. 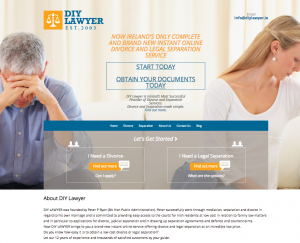 DIY LAWYER was founded by Peter P Ryan (BA Hon Public Administration). Peter successfully went through mediation, separation and divorce in regard to his own marriage and is committed to providing easy access to the courts for Irish residents at low cost in relation to family law matters and in particular to applications for divorce, judicial separation and in drawing up separation agreements and defence and counterclaims. Getting an online divorce with DIY Lawyer is relatively simple. You just purchase the package that you need, then follow the steps and fill in the forms. Print these off and sent them as per the instructions. It could save you thousands in legal fees! Click here to get your divorce proceedings started today!